If children make purchasing decisions themselves, they must accept responsibility for them. However, this needs to be learned. Chores are a good opportunity for children to learn about responsibility. But what should be noted, and should you give rewards for chores? Child and family psychologist Sabine Brunner gives five tips for everyday family life. When children are assigned their first chores, they learn to take on responsibility. Important for learning: The children should see that everyone – parents and children – has a job to do. Basically, it is about children perceiving everyday tasks as something that is just a part of life. It is therefore sensible to include children in everyday things from a young age. Often, completing the chores then takes a little longer, but it helps create the mood that everyone is contributing to the family community. Even the little ones between two and three years old have fun helping their parents and doing something meaningful. And above all, it makes children proud when they have completed a task, and that is good for self-esteem. The chores for siblings can certainly be different according to their ages. A six-year-old fully understands that their three-year-old brother or sister will get a task that is easier. Furthermore, you specifically define how and when to do something. Because only then can children also understand when they have done something well or not so well. A chore plan can give children and parents a helpful overview. 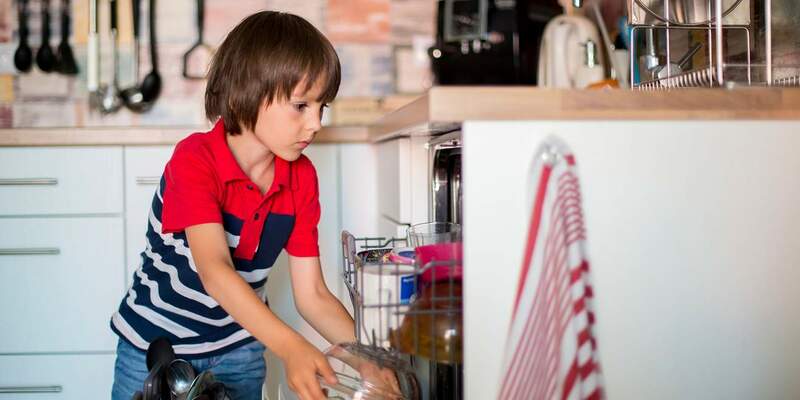 ...children enjoy small household tasks: for example, helping their parents unload the dishwasher. ...they are happy to help out. Suitable chores include emptying the wastebasket, dusting furniture, watering flowers, and clearing away their stuff. ...children can load and unload the dishwasher themselves, fold and put away the laundry, put away groceries, or wipe the table. ...children can shop on their own, cook a simple meal, and iron. Children can do bigger chores that don't regularly need to be done to increase their pocket money, such as raking leaves in the fall, mowing the lawn, or helping to wash the car. In principle, money is a bad currency within the family – what matters is trust, helpfulness, and family community. Therefore, chores should generally not be rewarded. There are, however, special tasks that warrant children being able to earn a few francs – such as working in the garden or washing the car. That way, they learn they can get things they want faster by getting involved. Ideally, such additional tasks are voluntary and the child should be allowed to decline them without consequence. With Digipigi apps, you and your child can agree on chores and set up a reward for special tasks; that way, your child can earn money while also getting a feel for the value of labor and wages. Regarding chores, they should not be impossible to do, be rigid, and in the end, involve coercion. If a low point is reached in taking on a task, you should consider along with your child whether there is another activity that they would rather do. Chores are not meant to be punishments or instruments of power, because all tasks should be able to be connected to a positive feeling. It is important here that you don't correct tasks yourself if they did not meet your expectations. For example, don't wipe down the table again because it isn't really clean. That shows the child that they didn't really do the job well. And that allows for uncertainties. If a task could be handled better, show your child how to do it and calmly explain what didn't go so well. Chores should not be the center of everyday family life. Children have other important things to deal with, such as school, friends, and their own development. Of course, children should participate in the family community by having chores and earning money with extra tasks, but this shouldn't be a central part of the child's life. The psychologist and psychotherapist for children, young people, and families is a mother of two children and has worked as a research assistant at the Marie Meierhofer Institute for the Child for the last 10 years. She is jointly responsible for the area of psychological services and fundamentals. Child participation and child protection are particularly important to her. In delegated practice, she also works as a psychotherapist for children, young people, and families.